Corn, also called as Maize, is a grain plant that originated in southern Mexico. Different types of corns are available like dent corn, flint corn, pod corn, popcorn, flour corn, and sweet corn. Maize comes in multiple colors such as yellow, white, red, brown, blue and purple, based on the nature of species and where the corn is grown. Seeds of corn are the main part of the plant most commonly consumed by people. Corn is one of the most popular cereals in the world and forms the staple food in many countries because of its nutritional facts and health benefits. Certain quota in maize production is allocated for corn ethanol, animal feed and other maize products, such as corn starch. But corn syrup, popcorn and sweet corn are commonly eaten varieties. Corn is packed with good amount of vitamins, minerals, carbohydrates, proteins and antioxidants. 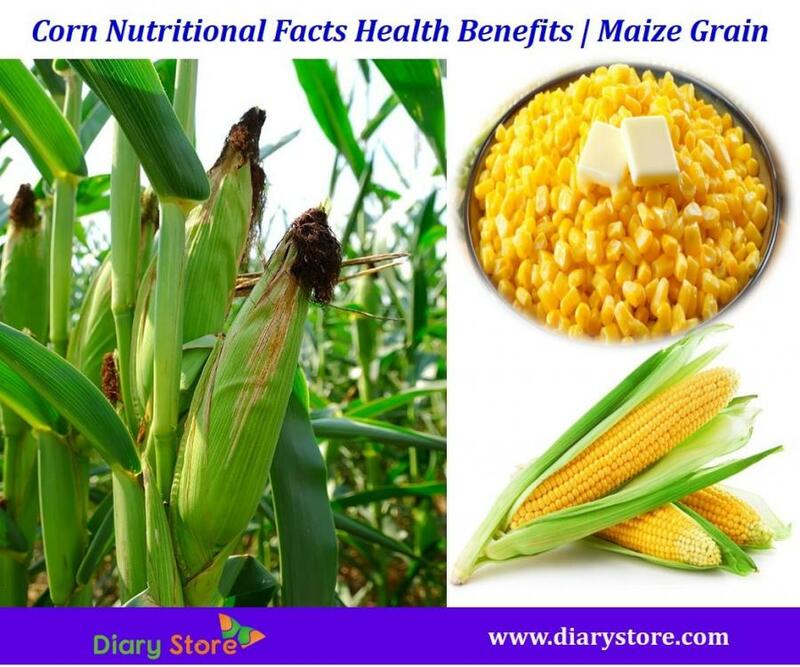 Hereunder are the nutritional facts of maize, yellow and raw seeds, nutrition value per 100 grams (3.5 Oz) and percentage of RDA (Recommended Dietary Allowance). Corn contains both soluble and insoluble fiber,which help to prevent digestive problems like constipation and hemorrhoids. The deficiency of iron and vitamin B12 and folic acid can cause anemia. Corn contains good amount of these so it prevents the anemia. LDL or Bad cholesterol can cause the cardiovascular diseases. Bad cholesterol increases due intake of fatty foods. Corn contains vitamin C, carotenoids and bio-flavonoids, which control the bad cholesterol levels. Consumption of corn oil lowers the bad cholesterol levels by reducing the cholesterol absorption by the body. Maize contains enough quantities of calories and carbs, which helps to gain your weight. Daily consumption of corn is the best option for quick weight gain. Corn contains rich amount of beta-carotene which forms vitamin A in the body and is essential for the maintenance of good vision. It also contains carotenoids, lutein and zeaxanthin, which reduce risk of macular degeneration and cataracts. Corn is good source of antioxidants, which help to remove the free radicals and keep the skin health. It starch used as an ingredient in many cosmetic products and it is used to soothe skin irritation and cure dermal rashes. Due to the presence of phenolic phyto-chemicals, it helps in the management of non-insulin dependent diabetes mellitus (NIDDM) and protects against the hypertension. Regular consumption of corn reduces the chance of spikes and drops for diabetic patients because it contains phyto-chemicals which can regulate the absorption and release of insulin in the body. 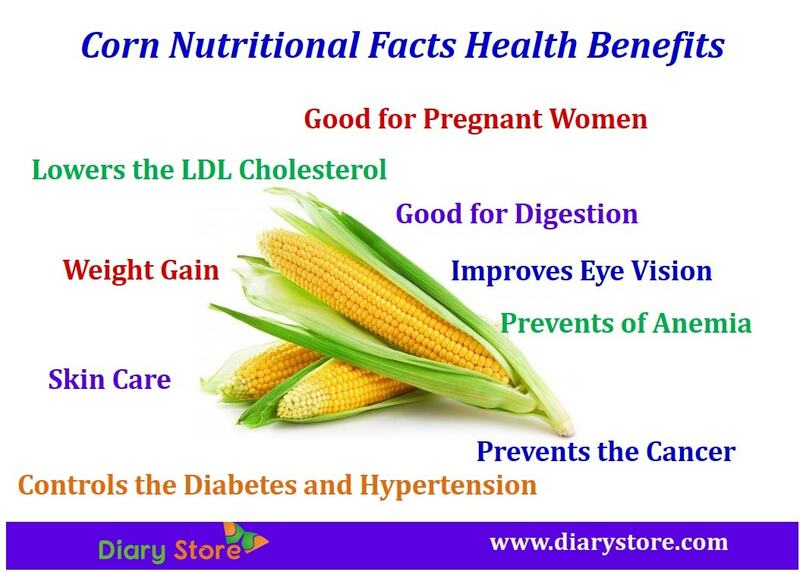 Corns contain folic acid which is beneficial for the health of both child and mother. Deficiency of folic acid in pregnant women affects baby. So corns can be included in the diet of pregnant women. Corns are rich in antioxidants; these oxidants fight against the cancer-causing free radicals. It is also a good source of phenolic compound, ferulic acid, which is effective against liver and breast tumors.